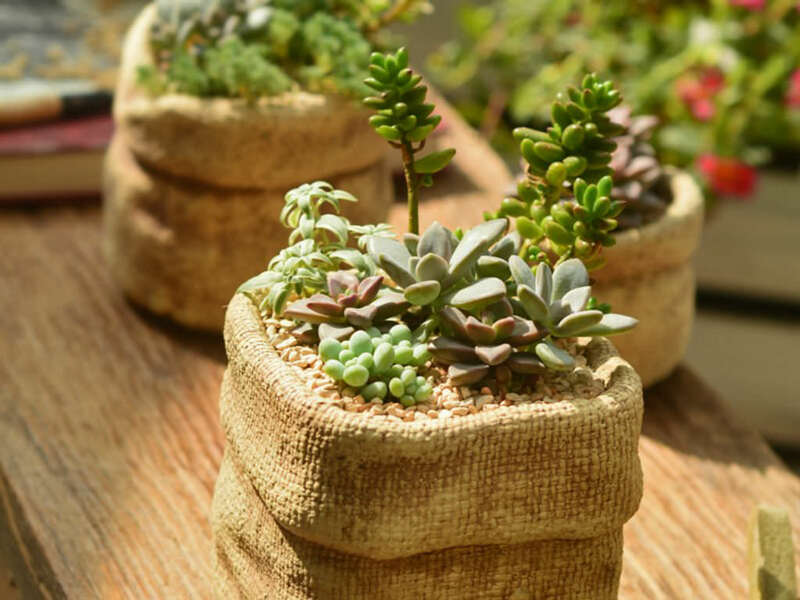 Succulents are undoubtedly growing in popularity. They come in dozens of varieties, boasting different colors and shapes that can be mixed and matched to create a centerpiece or other decorations in the home. If you’re new to gardening or have had bad luck with houseplants in the past, try your hand at caring for succulents indoors. Succulents are grown outdoors but are brought indoors during the winter months. It’s possible to grow succulents indoors year-round, though. You may be familiar with some types of succulents, like Aloe vera, Jade Plant and Snake Plant. While succulents can also be placed outdoors during the growing season, keep them indoors in a bright, sunny location, like a south-facing or west-facing window. Most succulents thrive if the relative humidity of the house is between 10 and 30 percent. Keep succulents away from drafty locations. Rely on natural lighting if possible when growing succulents indoors. You can use artificial lighting, like a cool white fluorescent tube, in place of natural light if necessary, or in combination with natural light. If you’re using cool white fluorescent tubes, keep them 6 to 12 inches (15 to 30 cm) above succulents, and keep them on for 12 to 16 hours each day. Plant succulents in well-draining, sandy soil. Cornell Cooperative Extension suggests planting succulents in two parts garden soil, two parts sharp builders soil and one part peat. Or, you can use a combination of one part potting soil and one part coarse sand, as recommended by Minnesota State University Extension. Soil that doesn’t drain well may contribute to root and stem rot. Consider planting succulents in porous containers with drainage holes, like unglazed terracotta or clay pots. Succulents don’t require as much water as some other houseplants. Water sparingly. Allow the soil to dry out completely before watering succulents. Allow water to drain out, then discard the excess water. If you water succulents too much, the stems and roots may rot and the leaves will drop. Succulent leaves will wilt if you haven’t watered enough. Avoid watering in frequent, small amounts. This can affect growth by making plants sickly and by causing roots to become weak and shallow. Also, be careful not to water too much during winter, which is the dormant period for succulents. Succulents can be fertilized with houseplant food that’s diluted to half its recommended rate. The houseplant food should be higher in phosphorus than nitrogen. During the growing season, fertilize succulents once or twice a month. Sometimes, succulents can become affected by mealybugs, scales and spider mites. To control mealybugs and scales, soak cotton swabs in rubbing alcohol and dab the plant. To control spider mites, spray succulents with insecticidal soaps.